How fast can you learn? How quickly can you adapt? Which sessions did you go to today? How do we cope with a quickly changing world? 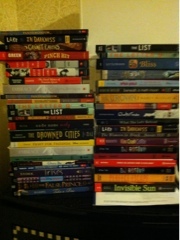 How will I get all these books home? How can I get more books? Who are you waiting in line to meet? Where does this bus go? This food is how much? Which of these five fabulous sessions should I go to next? Where is that room? Where is the elevator? Should I be changing the way I teach? Will there be a projector in the room where we are presenting? Where can I get your slides? Where did I leave that Hunger Games poster? Which do you use more your sense of humor or your ability to recognize foreshadowing? (Asked by Gordon Korman, twice.) How should we teach grammar? How should we select texts? Should students be writing novels? What was that app again? Can I get from session M to session N in time? One thing I do know for sure, Vegas Baby!